Shunning the camera, murder suspects (from left) Candice Beaty, Mareya Hannah and Morgan Shirley, all of Winfield, are shown during their transport from the Marion County Jail in Hamilton to the Marion County Courthouse where they appeared on Tuesday, May 3, for their arraignment hearing in connection with the death of William Jerome Henry of Fayette, who died from wounds related to an April 30 stabbing incident in Winfield. Also shown are Marion County Jail Administrator Scott Welch (far right) and jailer Joe Vasquez (background). Winfield - Two of the three alleged suspects in the murder of a Fayette man at a home in Winfield last weekend have confessed to committing the crime. The third suspect has since secured the legal services of an attorney, according to Winfield authorities. The house is located in what is still known to many as the Mill Village near the former home of the Winfield Cotton Mill west of the old Winfield Post Office. William Jerome Henry, 48, died from a stab wound to the back. He was transported to Northwest Medical Center in Winfield by Marion County Emergency Medical Services. He was later pronounced dead at the facility. Husband and wife Candice Beaty and Mareya Hannah of Winfield have confessed to the crime, according to authorities in charge of the case. Morgan Shirley, who is Beaty’s step-father, had not offered any information to authorities regarding his role in what happened at 137 Mill Street. 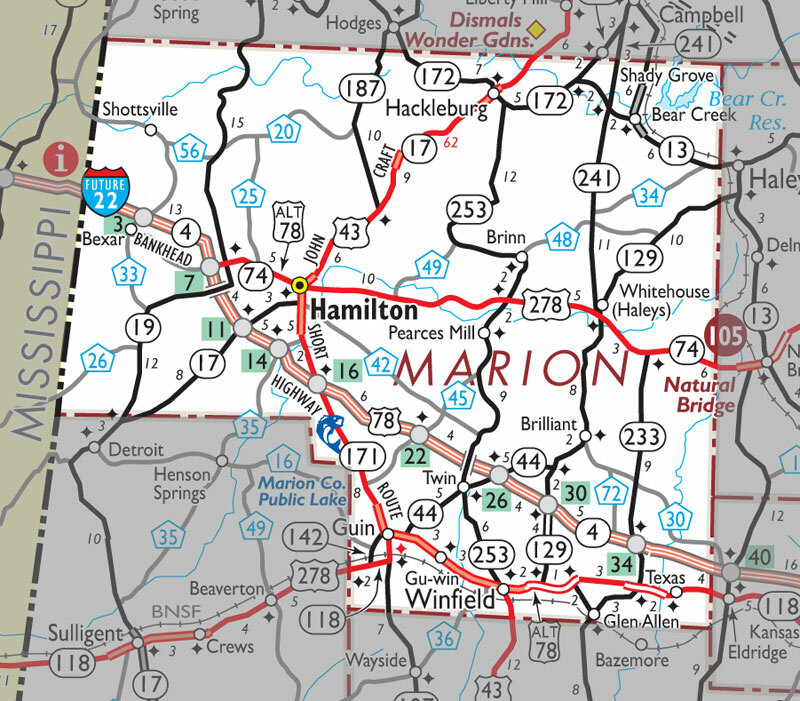 The three are being held at the Marion County Jail in Hamilton without bond and are all charged with murder, along with first-degree robbery and drug charges. Winfield Police Investigator Brett Burleson said the bond hearing was held on Tuesday, May 3, at the Marion County Courthouse in Hamilton with Marion County Circuit Court Judge Lee Carter presiding. Without offering details of the confession, Burleson said Beaty and Hannah provided information in the case during an interview at the county jail on Tuesday. Joining Burleson in the interview process was Winfield Narcotics Investigator Rusty Hulsey. “The original stories told were different than the one we finally received on Tuesday as part of the confession,’’ said Burleson in an interview with the Journal Record. Burleson said the four had been partying the night prior in the same house. Earlier in the day on Saturday, the four had driven to Sulligent to purchase illegal drug items. Returning to the house in Winfield, the four in the party began smoking marijuana with the three now in jail eventually attempting to steal the drugs Henry had in his possession. Burleson estimated the value of the drugs to be about $25. The suspects had also taken an undisclosed amount of cash from the victim prior to his death. In recounting how Henry was killed, Burleson said all three were involved in what the investigator called a “very serious beating.’’ He was stabbed one time in the back, but had also suffered multiple lacerations in what might have been attempts to avoid the knife attacks. Burleson said Beaty is the one believed to have struck the fatal blow with the knife, but the victim had also been struck in the head with a heavy object by Shirley. The victim was found less than 100 feet from the house when emergency personnel arrived. Beaty and Hannah were still at the house when police arrived. However, Burleson said that Shirley had fled the scene. Officers would not learn until more than eight hours after the stabbing a third party had been involved in the death. Shirley was later picked up by Marion County Sheriff’s Department deputies in an area north of Guin. Authorities had begun searching for him in an area with which he was familiar before receiving information of his whereabouts. “Let me say again, as I did when this story first came out, how much we appreciate the hard work and cooperation from the other departments,’’ Burleson said. Burleson commended the police departments from Guin and Brilliant as well as the sheriff’s department.